This year we welcomed back seven of our study and service groups from Thailand, Netherlands and the USA. The purpose of the study trips was to engage students with educational and fun activities that allowed them to understand the interrelationships between culture, nature, and human activity. By helping students recognize the links between human activity and the environment, we encourage local, regional, and global citizenship. Understanding and respecting the world helps students to realize their place and responsibility to reduce their impact on the environment. KIS International School from Bangkok came back for their third year in a row. They lend a helping hand to the Foundation for Education and Development by having an interactive English camp and building a garden to plant vegetables and trees. 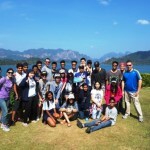 They also visited Cheow Lan Lake to learn about the local history of this massive reservoir. Swimming, Kayaking and a tour to a cave was also part of the Lake adventure. The ROSS School from Long island New York returned for their second year and participated in a 14 day s pecialized program that involved a homestay in Ban Tale Nok, Muiy Thai training, Cheow Lan Lake and Khao Sok National Park. They were able to learn about local culture, the environment and also just enjoy the natural beauty of Thailand. One special event that they were able to experience was a candle ceremony at a local Thai temple. The locals gathered and walked around the temple three times by candlelight on a full moon to signify when Buddha was enlightened. Specialized tours are always exciting because they push Andaman Discoveries to continuously look or seek out new community partners. For this student group, we were able to find and recruit a local Muiy Thai group. ROSS School had a unique experience and learnt Muiy Thai in a small village setting with local trainers and young kids who train after school. The head trainer’s purpose for the group is to give young kids something to commit to and be a part of, so that they stay out of trouble. ROSS school generously donated enough money for the Muiy Thai group to purchase new equipment. The school also donated money to the Moken fund to support medical needs. We thank ROSS school for their generous donations and active students within their school. We hope to see you all back next year! Hilversum School from the Netherlands For the third year in a row, Andaman Discoveries was happy to welcome back the International School Hilversum group for their annual study and service trip, with which the students focus on community service, culture and nature. The group of 23 from the Netherlands visited the North Andaman Coast for a ten day tour that included a night in Phuket, a homestay at Ban Talae Nok, three days at the Burmese Learning Center, and three days at Home & Life Foundation to complete the service trip portion of the program. The work at the Burmese Learning Center included the outside of the buildings receiving a fresh coat of paint for the first time since its opening in 2012, a ‘Healthy Food Journey’ mural was painted on the outside of the kitchen and an afternoon of fun included traditional Dutch games and English language classes. Thanks to service trip groups like Hilversum, the BLC is able to develop in a positive and meaningful way each year. Without service trip group help, all of the extra things at the center that make it safer, more comfortable and more fun would be missing. This group also initiated the featured toothbrush campaign that is still working well with the teachers’ support! 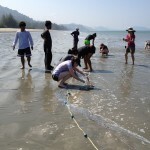 At Ban Talae Nok the students enjoyed making batik and Thai snacks, visiting the beautiful and natural Gam Islands for snorkeling and picnic lunch, as well as fishing from the beach before a local barbecue. Their time at Home & Life focused on building a small check dam in the river next to the home and laying concrete to help complete the floor renovations at the home. 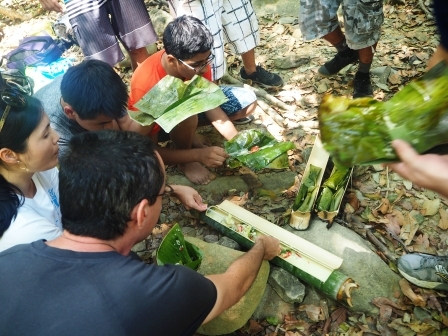 Through all of the activities the students were able to immerse in local culture, connect with nature and have fun! This group also fundraises each year to donate to the projects they visit, and the BLC was the fortunate recipient of a 100,000 Thai Baht donation! An extra special thank you goes out to the hard work and dedication of this Hilversum group! 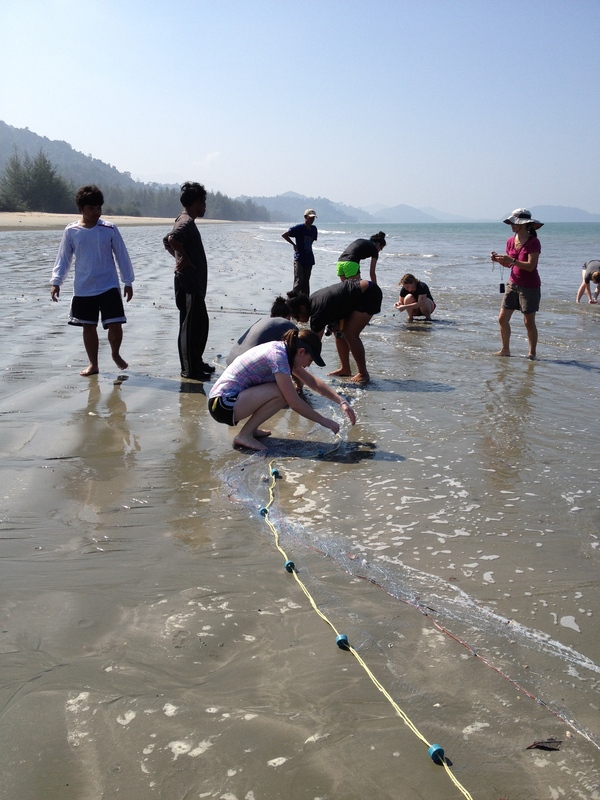 Phuket International Academy joined an Andaman Discoveries program for the first time. Their goal and purpose was to learn about river ecology. The 17 students began in Khao Sok National Park where they learned about river systems from the local communities. They took a canoe tour with the local s and then interviewed them about the importance of the river in their daily lives. 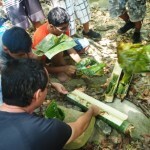 Jungle Survivor activities taught the kids how to use natural recourses found within nature, they were led by National Park guides and even cooked rice out of bamboo! The second portion of their trip was spent at Cheow Lan Lake. They stopped at the Dam to interview the local electric authority and learn about the history and current situation of the Dam, which creates the giant reservoir of Cheow Lan Lake. Throughout their time on the lake, they hiked to caves and explored the interesting limestone valley lowlands and rare wetland forests. The students were able to talk with the local communities to learn the connection between this reservoir and the ecosystems. Integral Travel’s group brought together like minded people who share a common goal while travelling. The group this year had a Yoga and Massage Focus that was practiced and shared within local communities. The group of eight travelled to the island of Koh Phrathong and participated in a homestay program in Ta Pai Yoi where they made Tie dye from mangrove bark and also roasted fresh cashew nuts. Early mornings were spent doing Yoga at a homestay that overlooked the ocean, with a beautiful view of the picturesque mainland. During the day, the group would venture to the school and do fun Yoga classes based on animal poses, they even taught some English through the giggling of silly poses. Another fun activity was going to the local health station to give massage to the local villagers. It was the first time that many local had a Western style massage; they all seemed very pleased and relaxed at the end! After Koh Phratong, the group travelled to Koh Surin to enjoy the beauty of the island. We arranged for a private Moken tour for one day where they learned about the Moken culture, how to spear fish and also how to row the traditional Moken Rowboat. The day was filled with laughter and a genuine interest in the traditions of the Moken of Koh Surin! The group then departed for their next adventure at Cheow Lan Lake. Linfield College, school of nursing, from the U.S.A returned this year with the objective to learn about Thailand’s medical system and to experience Thai culture in a homestay setting. While touring Phuket International Hospital and Kuraburi Local Hospital, they were able to observe the doctors, nurses and got an in depth experience of Thailand’s health system. They did a three day homestay program in Ban Tale Nok Village and participated in activities like making Batik, touring the mangrove ecosystem, making a Thai Dessert and weaving Nippa Palm leaves into roof panels. Throughout their time in the village, cultural exchange took place by sharing stories and asking questions with the help of an Andaman Discoveries translator. It is always a joy to have this group return with such an eagerness to learn from Thailand’s Hospitals and connect it to their own curriculum from their college courses. Teknomadics Adventure Group from the U.S.A. returned for the second year with four guests. Their mission is to care for the world we live in by offering Earth-conscious, transformative travel experiences that promote peace and understanding across cultures, while providing exceptional service and monumental adventure in majestic surroundings. Andaman Discoveries is always pleased to host responsible guests with such a positive outlook on travelling! The trip began in Kuraburi, where they hiked to a refreshing waterfall, talked with the monks at a local temple and visited an undeveloped stretch of beach! After relaxing in this quant town, they travelled to Koh Surin National Park to participate in a private Moken Tour. This entailed snorkeling with a Moken guide, walking a nature trail and learning about the Moken’s traditional uses for plants, spear fishing and rowing the traditional Moken boat. In between these exciting adventures, the group was able to experience the Moken village with their guide and learn about the culture and heritage of the Moken people! They also took a voyage to Cheow Lan Lake to bask in the beauty of nature!